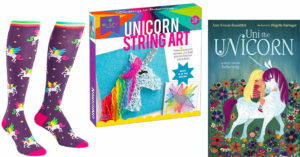 A Mighty Girl's top picks of games for children and teens where you work together to win! Most people associate board games with competition: players who work against one another in hopes of being the ultimate winner. And while these games can teach important skills — including how to be a good winner or loser — there's one skill they don't teach: cooperation. Working together as a team is an equally important lesson to learn, and it's also a great way to play when you've got a mixed group of different ages and abilities playing together! 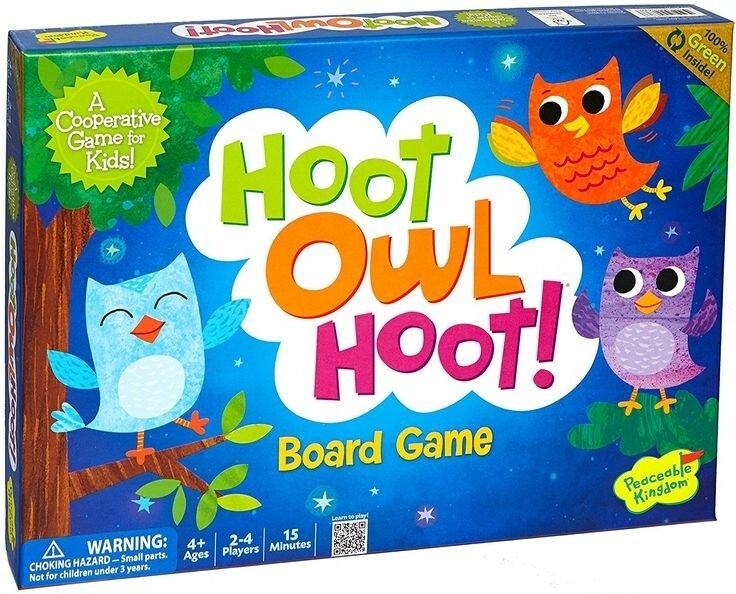 Cooperative board games are becoming increasingly common, and they provide a totally different flavor for a family or classroom game session. 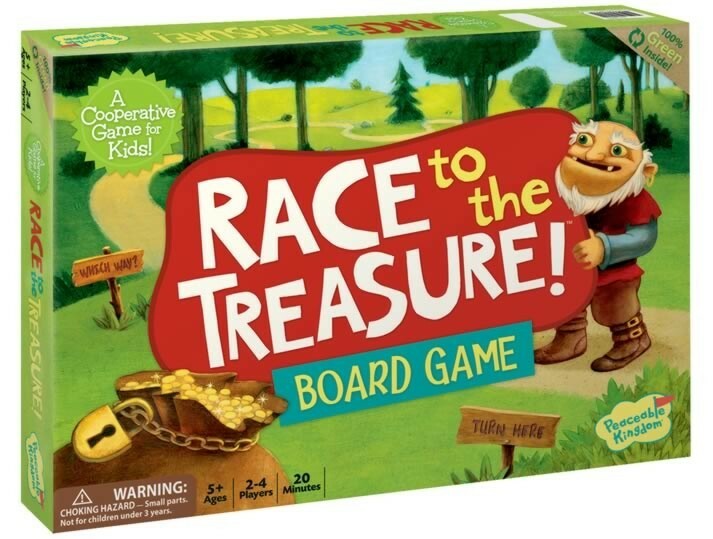 To introduce you to fun twist on the classic board game, in this blog post, we've featured 40 of favorite cooperative games for all ages! 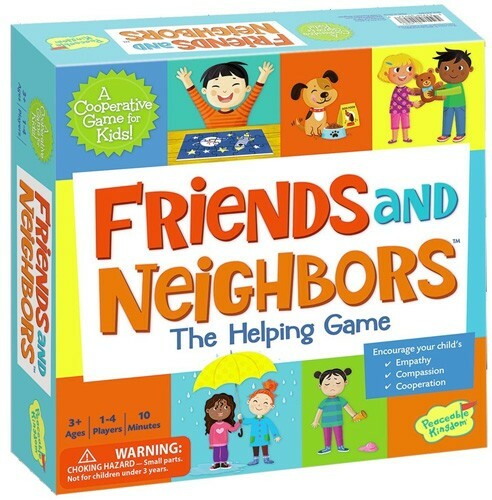 From simple games that encourage preschoolers to cooperate in order to achieve a common goal to complex games in which teens and adults have to strategize together and collaborate to complete a mission, these games do more than provide an evening's entertainment: they create a sense of teamwork and unity that players will love. For a wide variety of logic and strategy games, single-player games, competitive party games, and more, visit our extensive Games Collection. When you're a racing snail, your pace is a little more peaceful! Six colorful snails are racing, and both the first and the last will win. Can you guess which snail will cross the finish line first, and which will cruise in at the end? 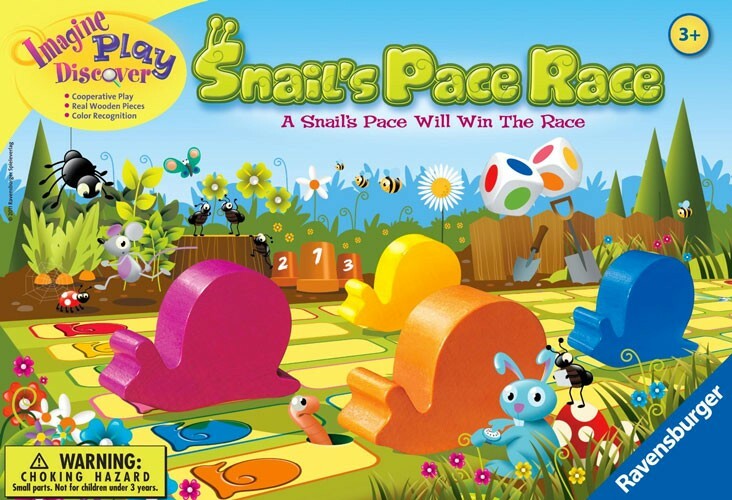 Each player is responsible for moving at least one of the snails, so kids will be active every turn as they watch to see if their snail's color shows up on the colorful cubes. In addition to cooperation, this fun game teaches color recognition skills along the way. 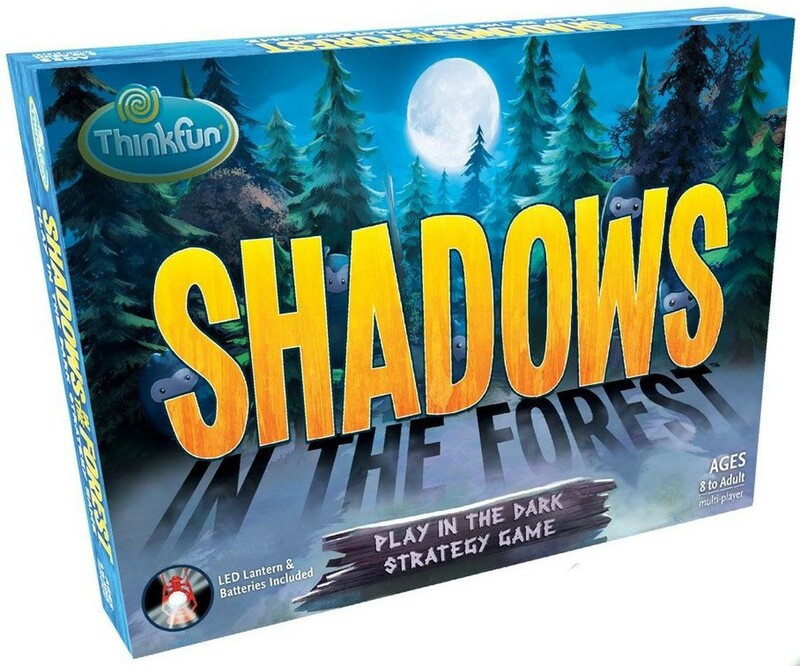 The friends and neighbors in this game have a variety of problems — from being afraid of the dark to getting wet in the rain — and if you're going to solve them, you'll need to work together! Grab a token out of the Helping Bag and see if you can figure out a way to help one of the people on the board. Kids will learn how to recognize and name emotions and develop a sense of empathy and compassion as they work together in this game. 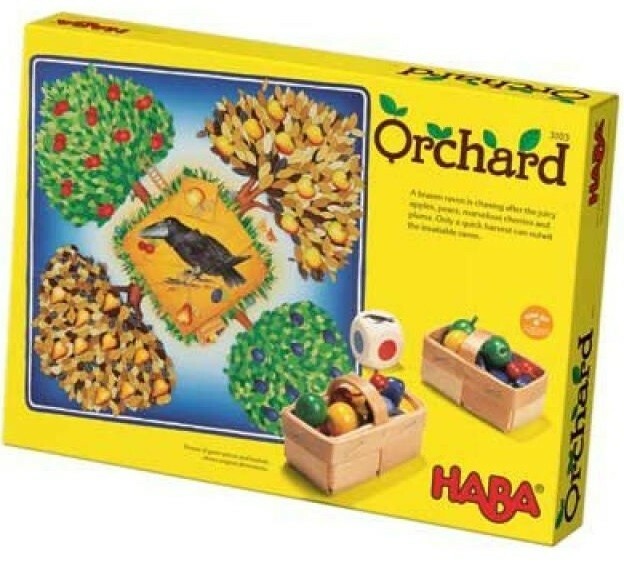 Harvest an orchard's worth of delicious fruit with this classic beginner's cooperative game! Red cherries, yellow pears, blue plums, and green apples all grow in this orchard, but the raven is greedily eying them. Roll the dice to see which kind of fruit you can pluck this turn, but if you roll the raven, you're one step closer to completing the raven puzzle, which means the raven eats his fill. This game celebrated 30 years of play in 2016 and it's still a favorite with families everywhere. There's a bunch of delicious carrots in the box of this game from Blue Orange! In Happy Bunny, you're helping the bunny find the longest, yummiest carrots to bring home. You can tell which ones they are because the bunny has already had a nibble! The rest are for the farmer hard at work in the field. 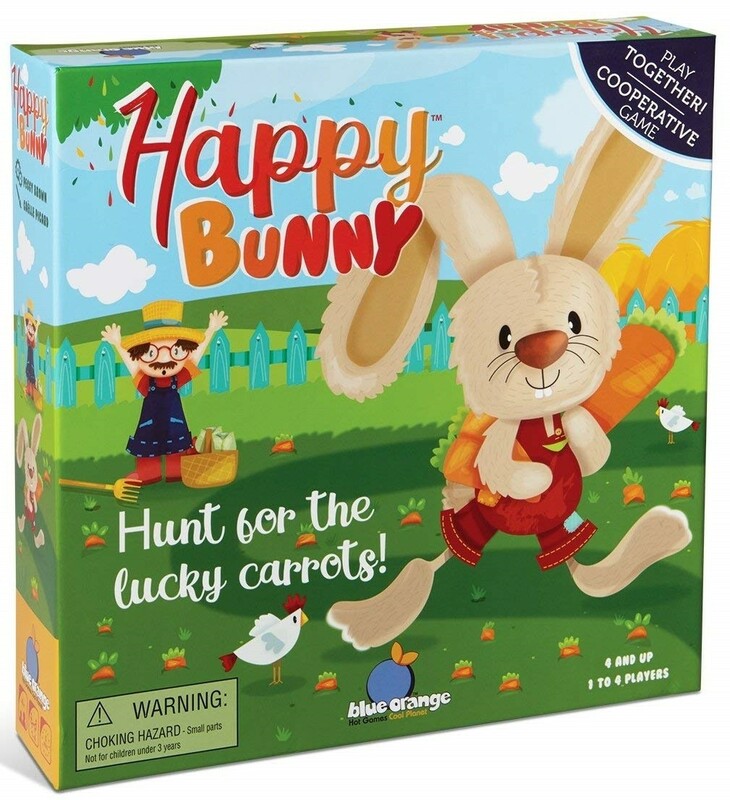 Kids will roll and move their way around the board, plucking carrots from the "field" in the box, and then compare the length of the farmer's carrots to the length of the bunny's to see who got the best harvest. 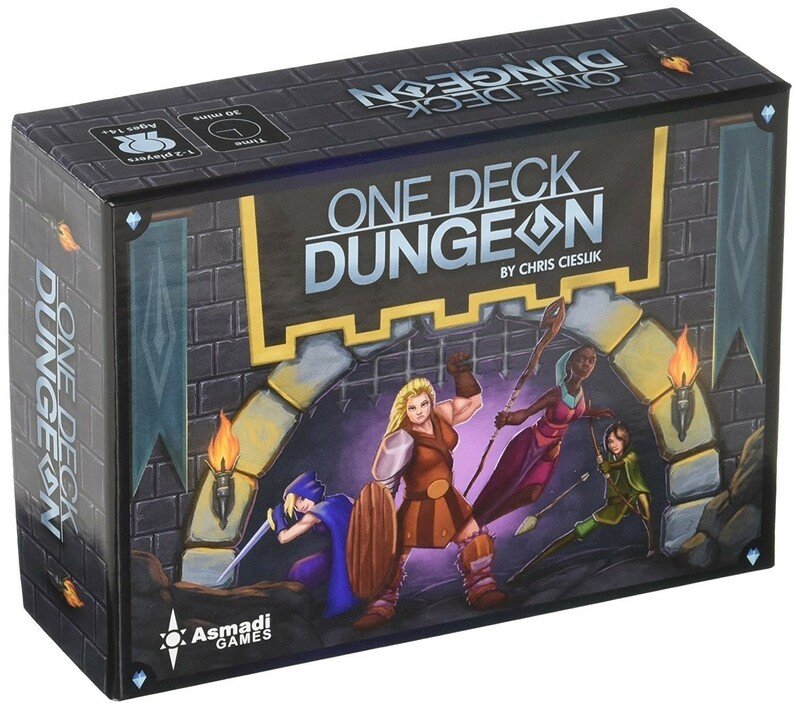 This 1 to 4 player game is a great introduction to dice rolling and basic math skills. 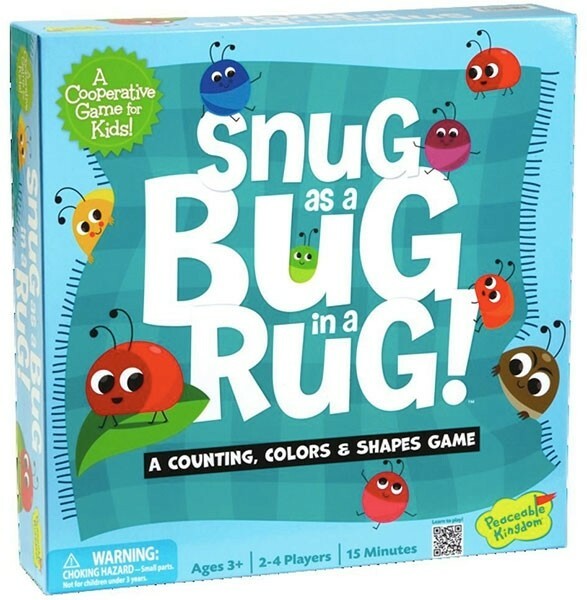 To win this game, players have to get all the colorful bugs snuggled under the rug! Roll the die or spin the spinner to figure out what attributes the bug needs, then tuck a matching bug in safe and sound. If there's no match, you have to pull out a stink bug — three stink bugs and the game is over! Three variants of play get kids matching color, eye sizes, shapes, and more. 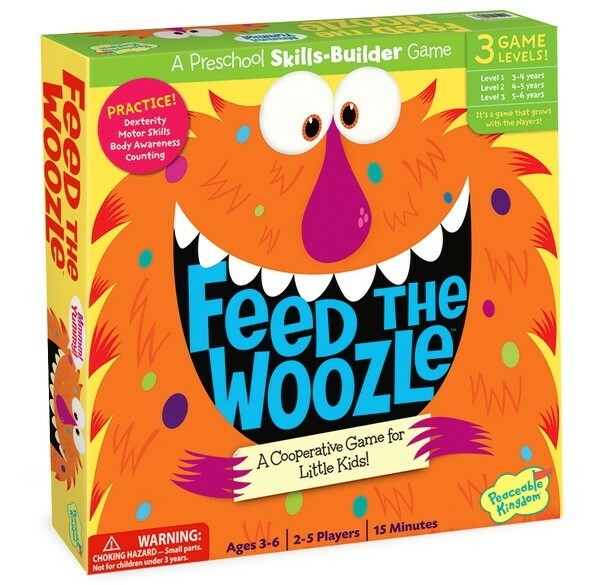 The cheerful, fuzzy Woozle is hungry! Fortunately, you've got a selection of yummy snacks the Woozle loves, like chocolate covered flies and hairy pickles. Roll the die to see how many snacks you should stack on your spoon, then flick the spinner to see how to get it to the Woozle — you might have to bunny hop, walk backwards, or just go crazy! It's a great option to incorporate some physical play into game time. Under the Big Top, the animals are creating an incredible pyramid — and they need your help! 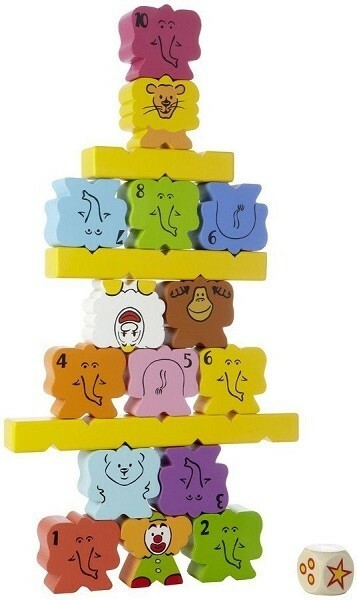 You need to stack the elephants in order from 1 to 10; if you get the tenth elephant up, you win! Roll the dice to see how many elephants you need to place, or if you'll have to place another animal or a balance bar instead. This game can be played competitively, but it's also an excellent cooperative building project — with a helping of number recognition and sequencing along the way. Those silly baby chicks have gotten out of the barn, and Mother Hen has to get them all back home! Spin to figure out how far to move, then collect one chick for every space you moved. Your objective is to get all the chicks in the coop before Mother Hen runs out of spaces. Watch out for the fox, who will scare one chick back out of the coop, and try to land on the +1 spaces that let you put an extra chick in! 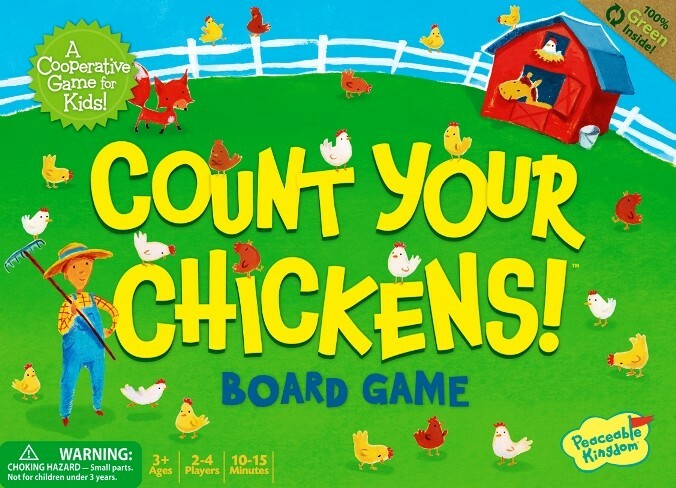 This game reinforces early counting skills and turn taking as well as cooperation. 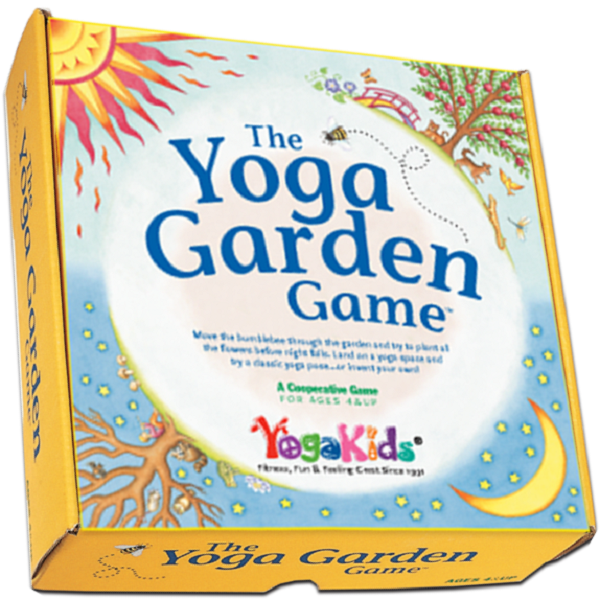 In this exploratory yoga game, kids cooperate to plant a beautiful garden before night falls — and try yoga poses along the way! As players move the bumblebee marker around the board, they will flip up yoga cards that direct them through a variety of poses. They'll even have a chance to create their own pose! It's a lovely, peaceful way to stretch, bend, and pose together. The owls have had a busy night — but they have to get home before the sun comes up! Players work together to fly the owls back to their nest. Draw a color card and you can move one owl to the next space of that color; think strategically and talk through which owl you should move. But be careful: draw a sun card and you're one step closer to the night being over! Two versions of this game allow the rules to grow along with your kids for extra years of playtime. Look out, mermaids — the Sea Witch is on the move! 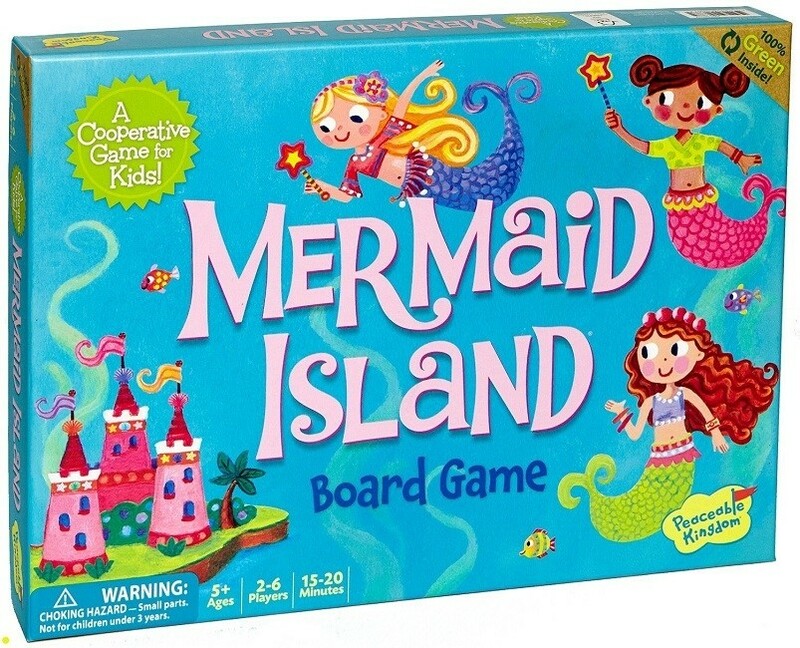 Players need to work together to get all of the mermaids safely to Mermaid Island. Each turn, players get to choose which mermaid to move. If you get a wand, you can push the Sea Witch back, but make sure that doesn't block one of the other mermaids from getting safely home! 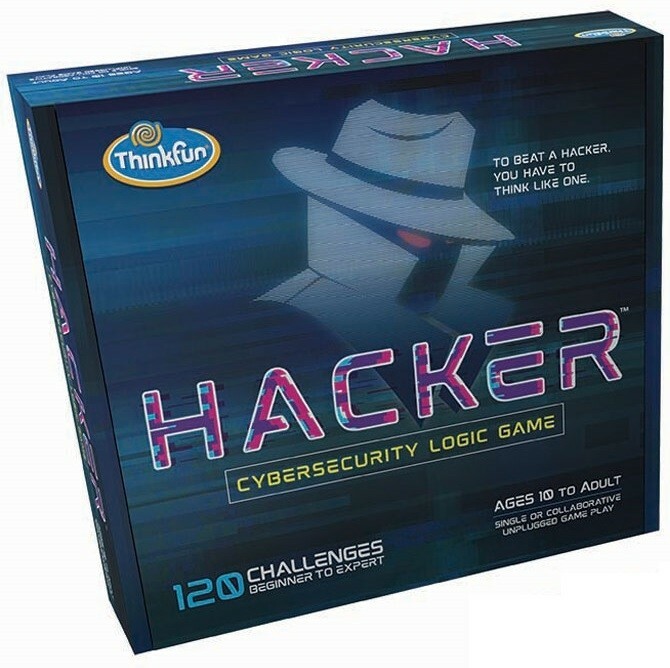 Kids will love this game's seemingly simple but lively and strategic play style. 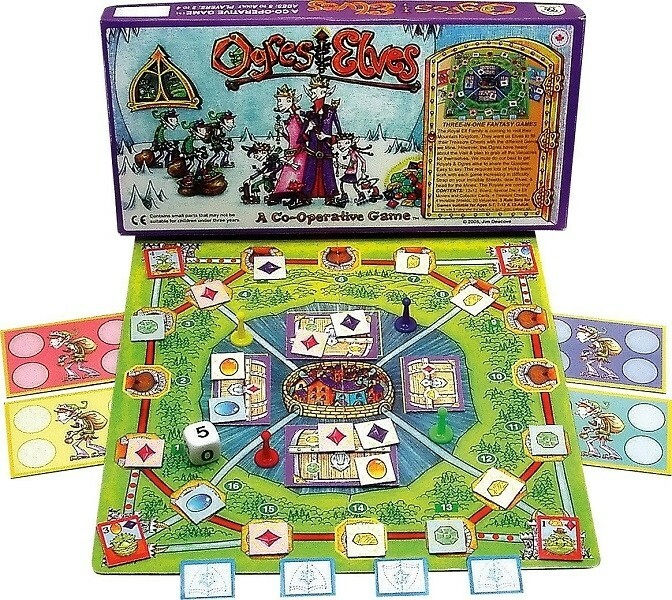 The classic story of cooperation gets a memory game adaptation in this board game! 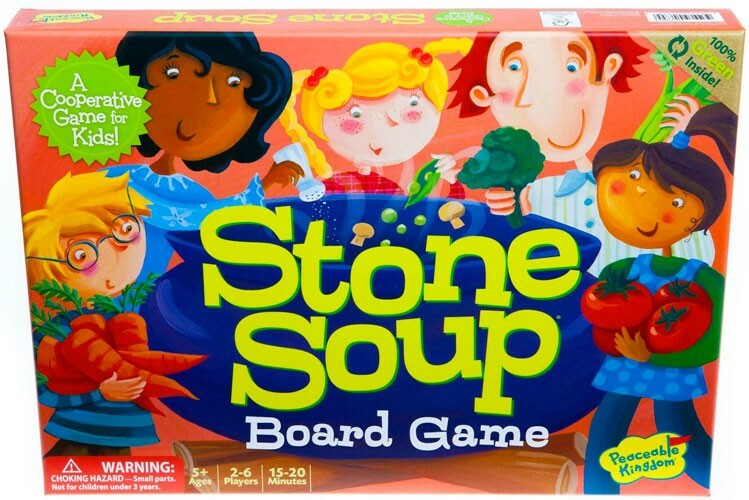 Players have to work together to "cook" a soup by matching ingredients. Make sure you work fast — if the fire under the kettle goes out, your soup won't cook, and everyone goes hungry. Kids will love the vivid colors and cheerful design of the cards and board, and they'll quickly discover how much easier it is to make the matches when you all remember together. 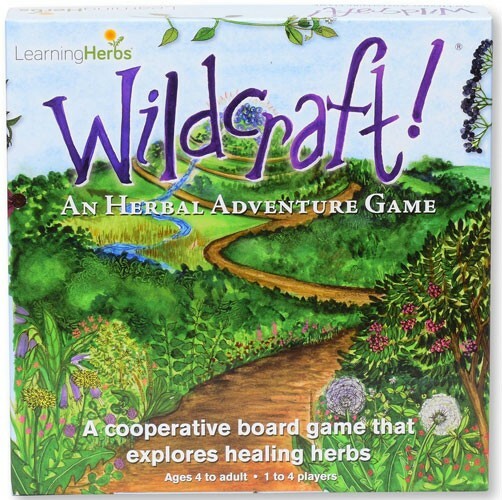 Learn about edible and medicinal plants in this unique cooperative board game! Players have to connect the icon on the challenge cards with icons on the plant card to move forward on the board — edible plants for hunger, medicinal plants for ailments like sore muscles and fever. Make your way up the mountain to the huckleberry patch and back to Grandma's before time runs out! This beautifully illustrated and educational game, with its "chutes and ladders" play style, is a fun way for kids to learn about the plants around us. 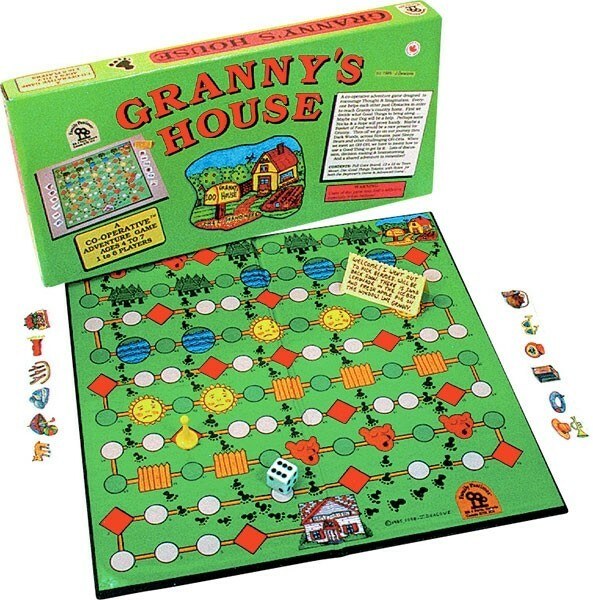 To get to Granny's House, you'll have to deal with any challenges that crop up on Oh-Oh Spaces. Fortunately, you get to choose some Good Things that could help you along your way, and Lucky Spots will let you choose additional Good Things. Throughout, you'll have to think strategically about what Good Things to use: you want to have at least one Good Thing to give Granny, and she'll probably enjoy a picnic lunch more than a pile of rocks! Thanks to all the variables this game offers, it never plays the same way twice, encouraging plenty of imaginative thinking. 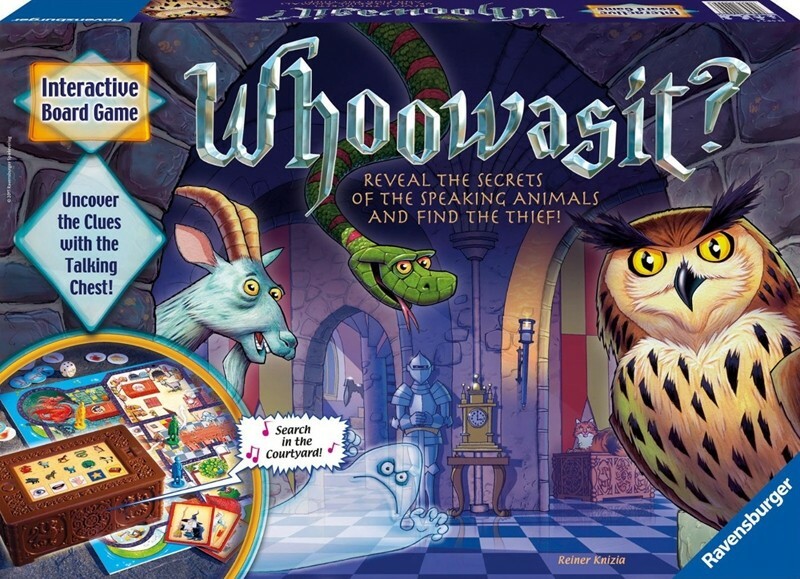 Budding detectives will love this classic cooperative mystery game! Players have to find a set of missing valuables hidden in the mansion by matching pairs of cards — but among the cards are twelve clocks, and if you flip all twelves before you find the valuables, the thieves may escape with the loot! As an added twist, three cards are hidden; when all the matches have been made, can your young sleuth figure out what's hiding behind the secret door? 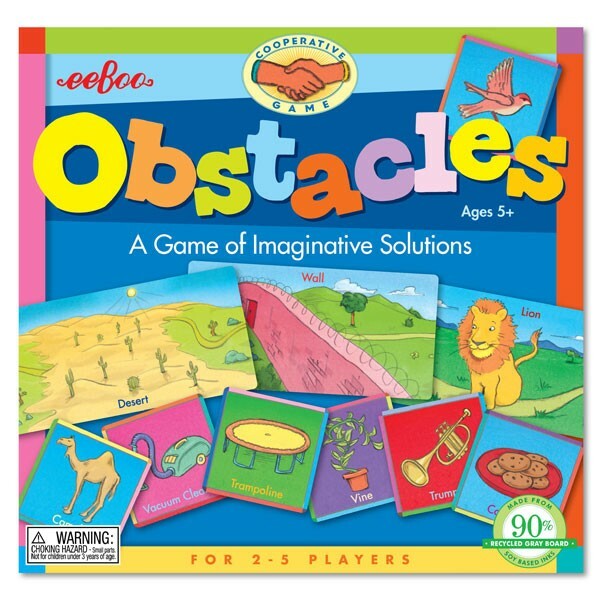 On this cooperative adventure, you'll run into all sorts of unexpected obstacles: everything from a giant wall to a dry desert to a roaming lion! Fortunately, each player has a set of tool cards they can use... but figuring out how to, say, defeat an ogre with a vacuum cleaner is half of the fun. In the end, they all have to get back home safely. This game encourages storytelling and creativity as well as fostering cooperation. The race is on! Players are trying to beat an Ogre to the treasure by creating a path from Start to End. It's not quite as simple as heading straight there, though! If you don't stop to pick up the three keys, you won't be able to get into the treasure. Players will have to cooperate and strategize so they can build their path quickly and get the gold. In addition to cooperation and strategy, this game gets kids thinking about math grid concepts and encourages collaborative decision making. The Queen has called her fearless knights to help unite the kingdom — but to do it, they'll have to avoid or defeat the diving dragons! Players need to build a safe path across the board by placing tiles. However, dragons are going to appear in unexpected spots throughout the game. The knights can make detours to pick up equipment like helms, swords, and shields to defeat dragons blocking their way. This clever, quick-playing game is sure to be a favorite. Mrs. Plumpert is missing a prize pot pie, and her chickens are determined to crack the case! Move around the board to gather clues and use your special evidence scanner to rule out suspects. If you roll a success with the dice, you'll learn useful information... but if you fail, the fox gets that much closer to making good on his escape. 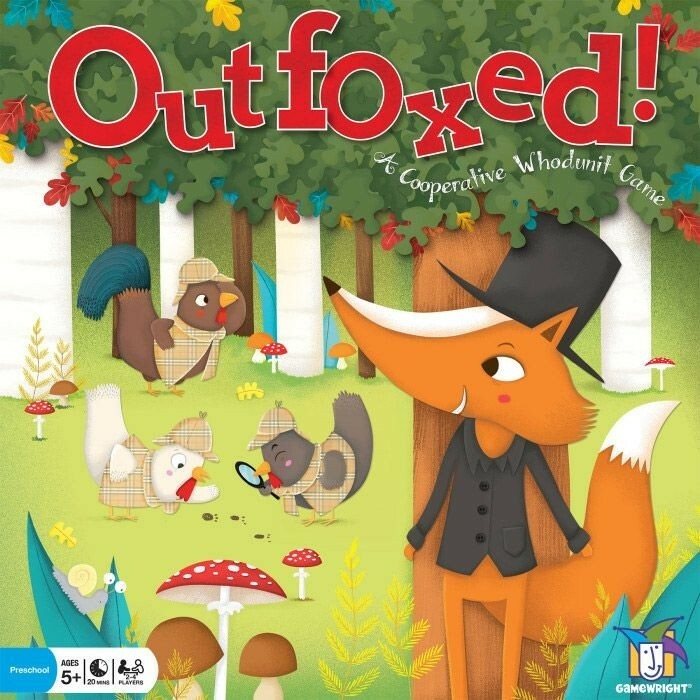 This deduction-based cooperative game is perfect for budding detectives. The evil wizard has cast a spell, but if you can figure out the ingredients necessary for a magic potion, you can break it! Once you know what ingredients you need, you have to move their bottles across the board and into the cauldron — before the wizard arrives to stop you. It'll take cooperation, strategy, and a handful of luck to save the day! 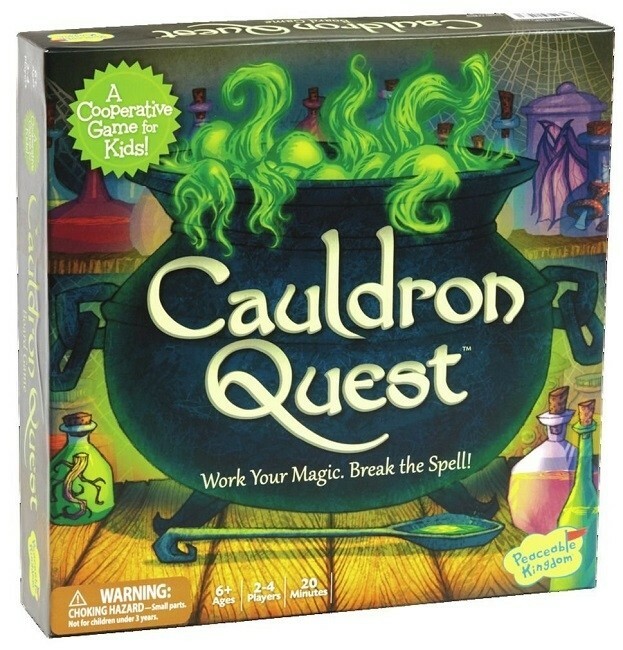 In addition to reinforcing concepts like evens and odds, this game also teaches strategy and deduction. The Royal Elf Family is visiting their mines to collect the jewels — but the Ogres want some of the valuables as well! Players have to work together to put some gems in the Royals' chests but also take the gems the Ogres like to them: after all, sharing resources is best for everyone. 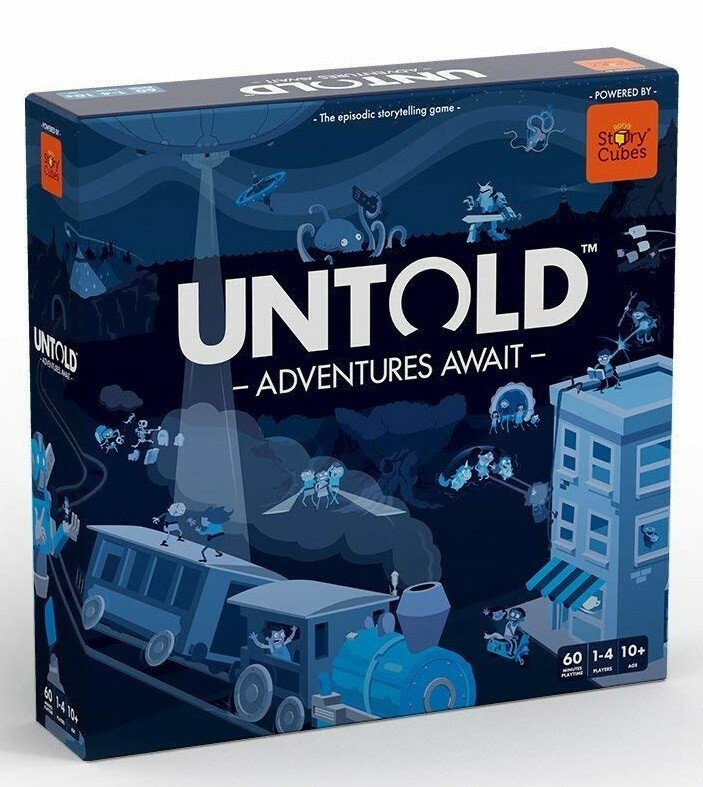 Three different game variants are included: an introductory version for ages 5 to 7, a more complex one for ages 7 to 12, and a challenging one for teens and adults. This market is having a busy day! Some people are buying, some people are returning, and some are just here to browse. But every stall needs to make a profit, or else they'll have to close up shop. Over the course of twelve rounds, players have to work together to put the Buying, Returning, and Just Looking customers in place so that the final tally is positive for every stall. 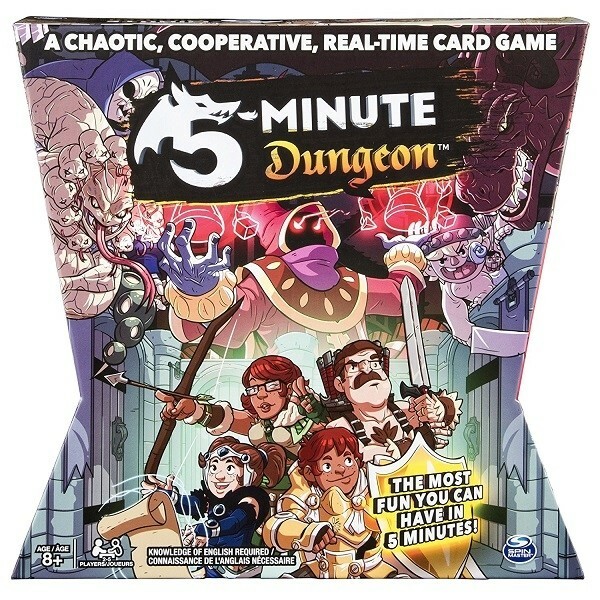 With two to six players, and a game variant for more advanced players, this is a great way to practice cooperative decision making and math skills using negative numbers. A unique talking treasure chest adds a fun twist to this game! Someone has stolen the king's magical ring, which protects the kingdom from the evil wizards. Fortunately, the animals saw the event... but only kids can understand what the animals say. When you arrive in a room in the castle, press a button on the chest to decide whether to search the room, speak to the animal, or cast a spell. Find the ring before the time runs out! A random component ensures lots of replayability for this unique game. Tell some amazing stories with these clever cubes designed to spark your imagination! Each cube features a variety of images; roll them like dice and then create a story using the pictures. 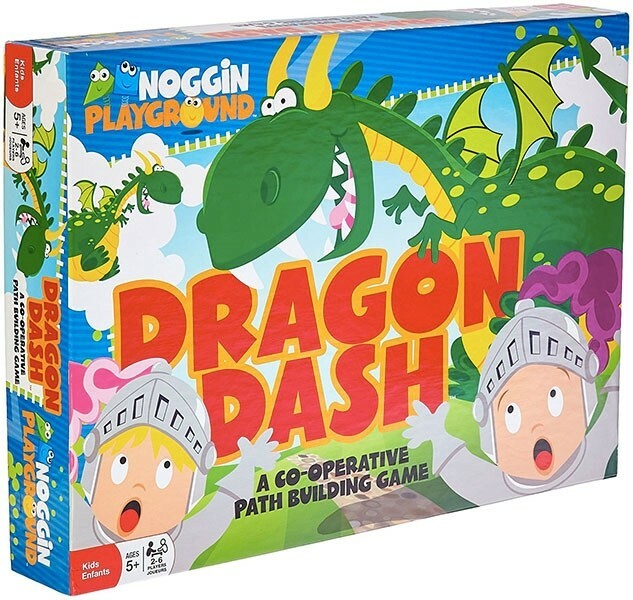 Although there are competitive variants of this game, it provides plenty of fodder for cooperation: maybe your storytelling teammates know just how to work in that sheep, flower, or lightning bolt! Rory's Story Cubes are also available in two more fun versions: Rory's Story Cubes - Voyages, designed to inspire stories of epic adventures and Rory's Story Cubes - Actions, featuring 54 everyday verbs, as well as a jumbo-sized MAX version that's big enough for classroom use. The Mole Rats need to get to the escape pod, without getting bitten by invading snakes — or accidentally falling though the airlock! Flip up cards to determine what to do each turn, from moving a Mole Rat to adding a snake to the board. Ladder spaces allow snakes and Mole Rats to move from level to level, either closer to the escape pod or out to the vacuum of space. 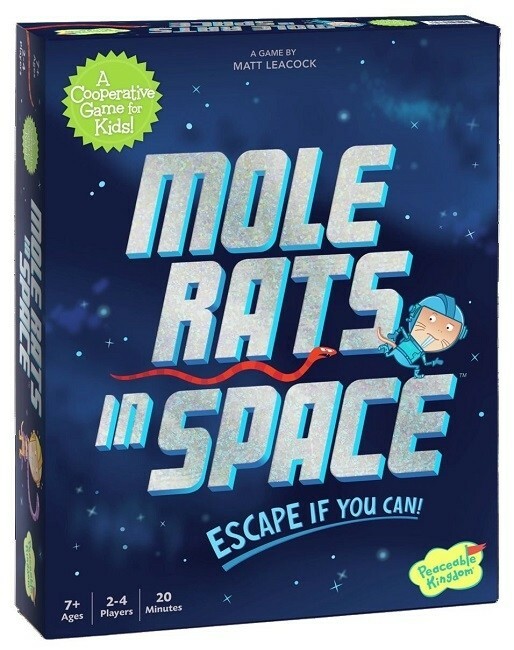 Get your Mole Rats to the pod — without a snake getting in — to win! A supplementary deck of cards is included for an added layer of challenge after you've mastered the base game. 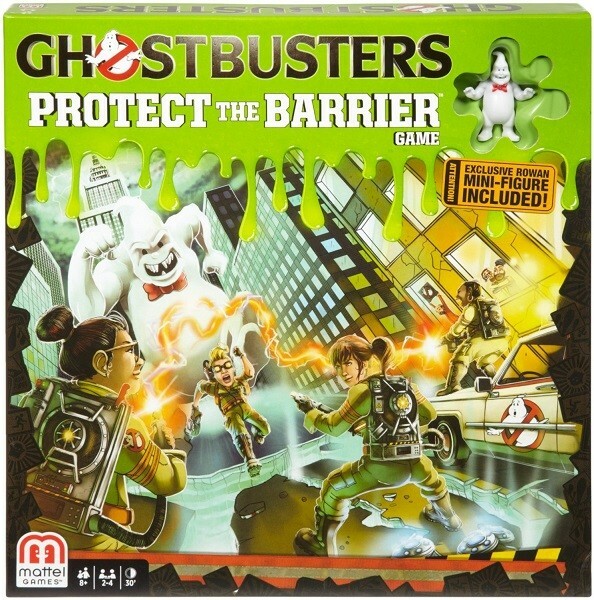 Fans of 2015's Ghostbusters will love this cooperative board game that lets them protect the barrier from Rowan's evil plan! There are Paranormal Energy Devices all over the Mercado Building, and the Ghostbusters have to get them all out. But they need to move fast: the longer they take, the more ghosts appear, and if six rooms get Haunted, you lose the game! Four different game options provide plenty of replayability for this fun game. A terrible crime has been committed — and the ghost of the victim is the only witness. Psychic investigators are trying to find the culprit, but the ghost can only communicate through a series of visions, represented by images on game cards. The investigators have a week — and the ghost's guidance — to try to identify the weapon, the location, and the killer. Unless they manage to interpret the visions correctly, a horrible criminal will get away with a perfect murder... The unique vision mechanic of this game is sure to provoke lots of discussion among members of your game group! An alien mothership is attacking Earth, and only the actions of brave pilots will save the day! 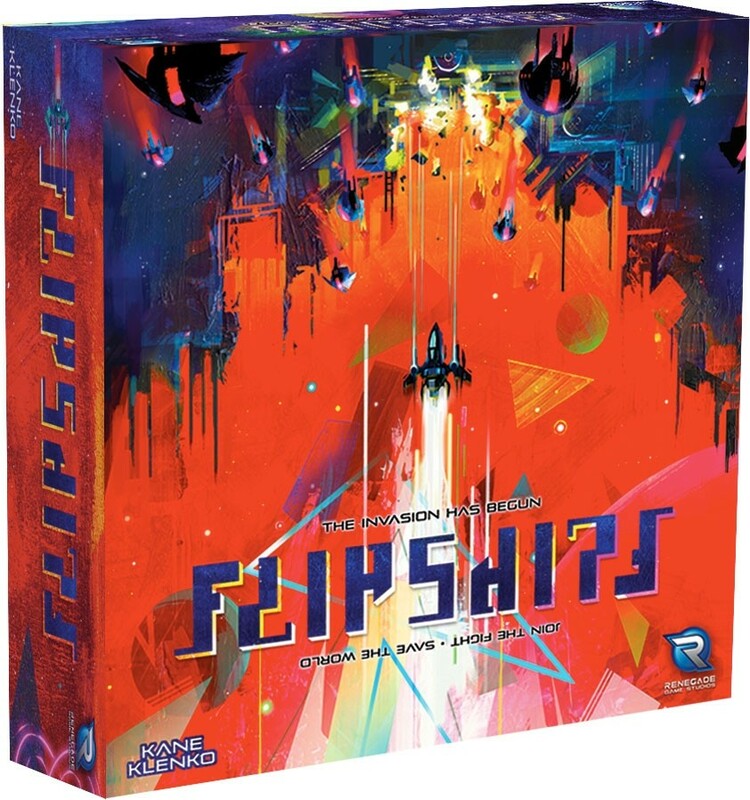 In this dexterity game, you "flip" your ships, working together to take out encroaching enemies and do enough damage to the mothership that the invaders are defeated. Since each player controls multiple ships, dexterity, luck, and cooperative strategy all play a role. 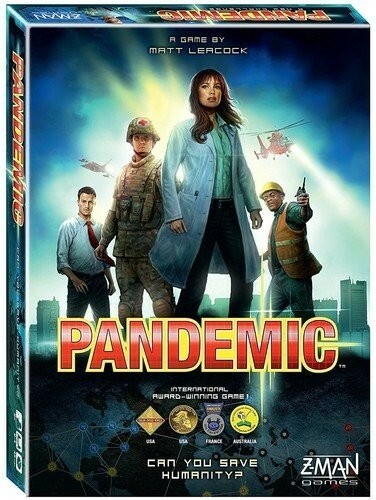 This well-designed game, which can also be played solo, scales effectively with the number of players, providing a unique and high-energy cooperative gaming experience. There are eight gems hiding inside this house... but ghosts are appearing all the time. 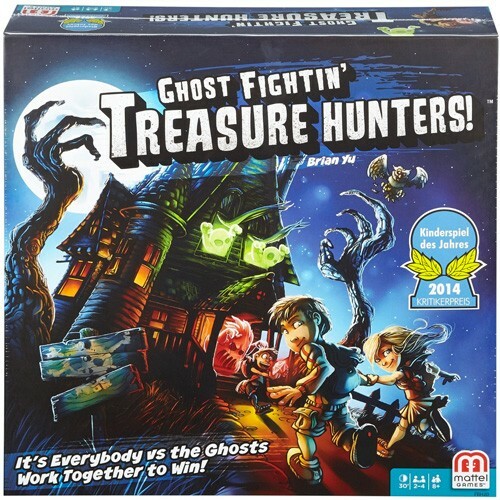 Your team are treasure hunters who have to work together to move gems, fight ghosts, and — hopefully — find all the loot before the house becomes haunted! The trick is that each character can only carry one gem; unless you work together, you'll never get them all out in time. 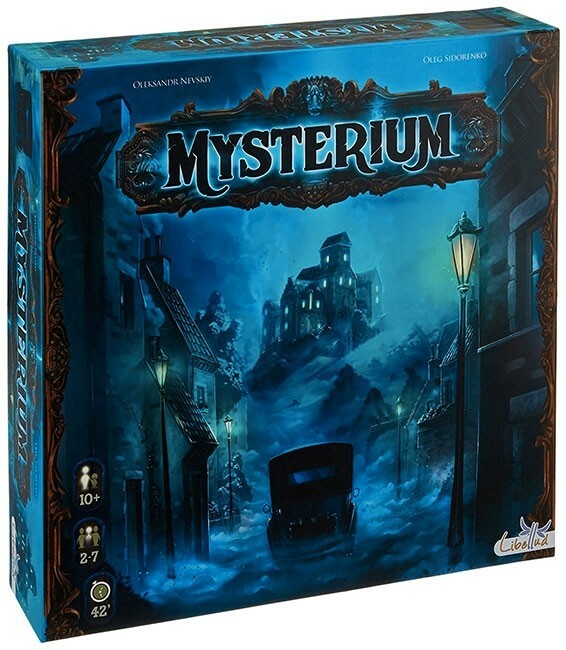 This award-winning German game is available in English for the first time, ready for your game group to go forth and find glory and gold against the ghosts! 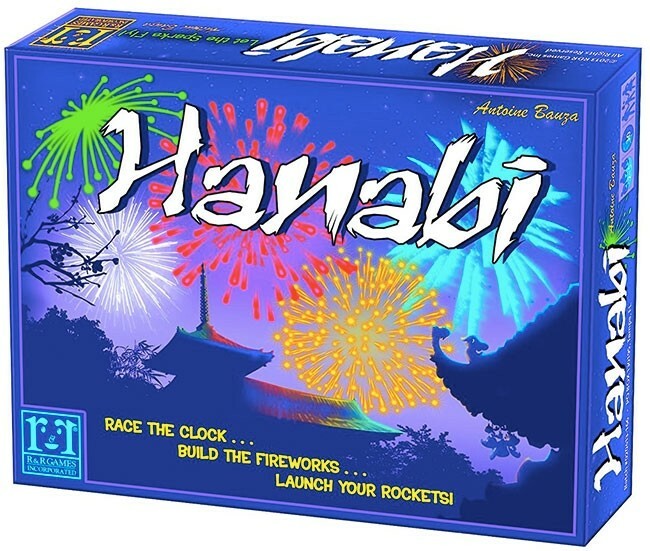 You and your fellow players are going to create the most spectacular fireworks display ever! The only problem is that, in the dark, you can't exactly see what you're doing... Players hold their cards so that only the other players can see them; your friends will have to give you critical information — and you'll have to remember the details — if you're going to make the audience cheer. Finish the fireworks display before you run out of cards, and it will be a night to remember! Mindfulness is a valuable skill to learn — and this game is a playful way to do it. Players take turns drawing a card, and then everyone performs the activity or reflection listed. 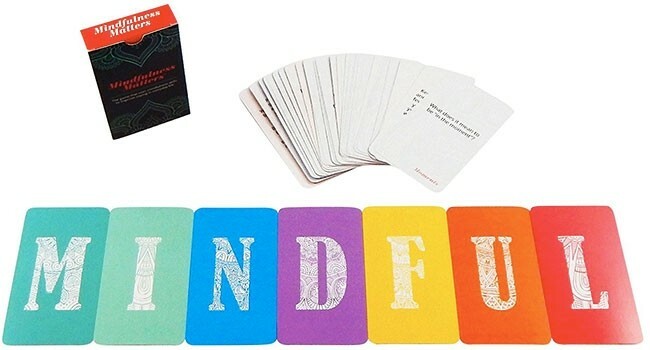 When you're done, flip the card over to show the letter, and keep going until you've spelled out the word "mindfulness." While a competitive variant is also included, the cooperative gameplay option both encourages kids (and adults) to be mindful together and also helps them practice these techniques for everyday life. 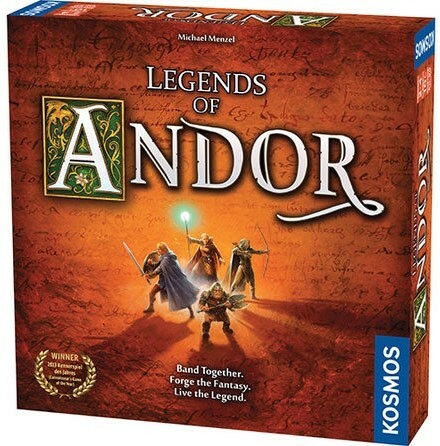 The country of Andor is in danger! Enemies are invading, and only your band of heroes can defend the castle of King Brandur. Make your plans, but be ready for unexpected changes as time progresses. If you succeed in defending the castle, there are more challenges to face: finding a medicinal herb to heal the king, descending into the mines for gems, and facing the ancient dragon. Are you ready to become legends? You can add two more players with the New Heroes expansion or play through even more legends with the Star Shield and Journey to the North expansion packs. 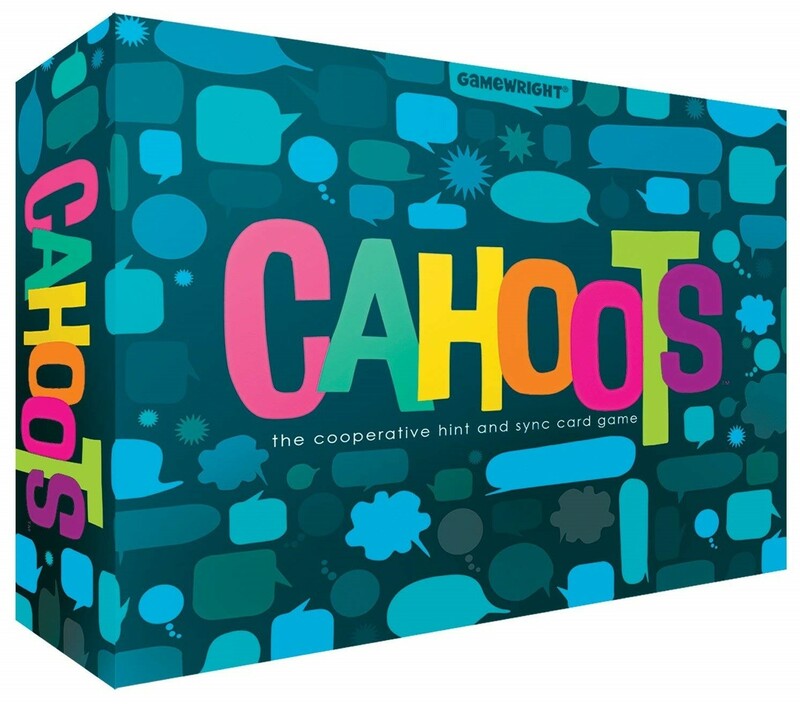 In this colorful card game from Gamewright, you and your fellow players will need to be in cahoots to win! To win, you need to complete a series of goals from the goal cards while playing cards to one of four piles by matching the color or number. The trick? You can't communicate what's in your hand. So if you're going to make sure that all the piles have a purple card on top, or all of the cards add up to 10, you'll have to get creative! This game for 2 to 4 players will take some clever chicanery to master. The Big Bad has a Plot to destroy Sunnydale — and the world — and only the Slayer stands in its way! Players work together to defeat Monsters of the Week and, eventually the Big Bad... they hope. The more monsters you defeat, the more you'll know about the Big Bad's Plot, but if the monsters do too much damage — to Sunnydale or to you — the Slayer is defeated and the world will fall. 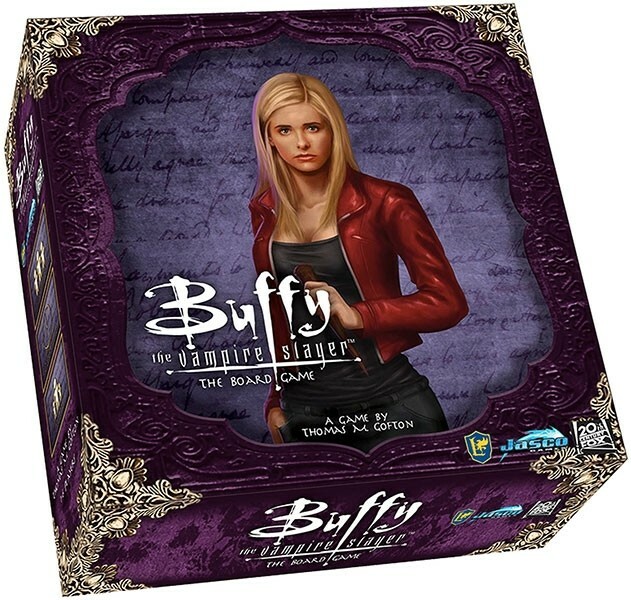 Fans of Buffy the Vampire Slayer will love getting to step into the Slayer's shoes! 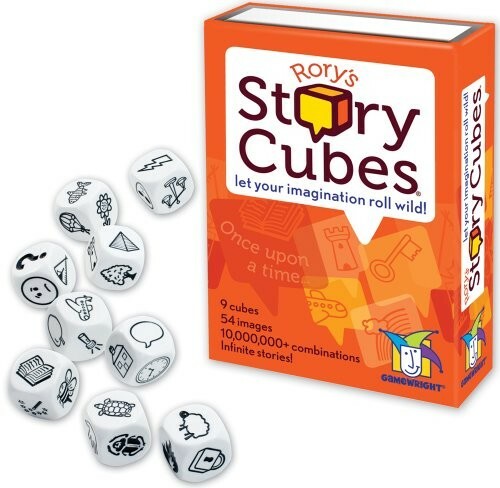 This game from Creativity Hub is a customizable storytelling project powered by Rory's Story Cubes! Every game of Untold is an episode that features five distinct scenes, complete with distinct locations, threats, and plot twists. In addition to the Story Cubes, Scene Cards provide more elements, while Reaction Cards show what happens when the players step into their various roles. It can be played solo or together for a single 60 minute episode, or use it to create a series — the only limit is your imagination. 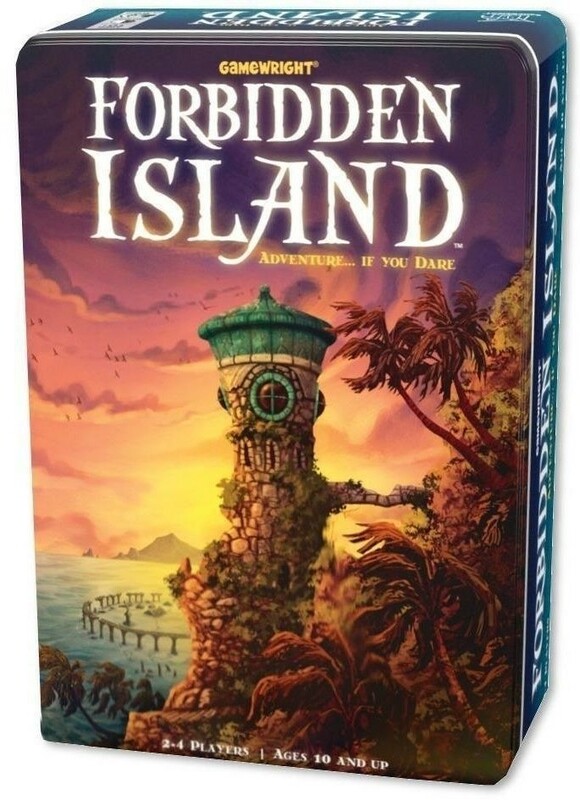 You're a team of daring adventurers, seeking four sacred treasures from the ruins on this island — but the island is sinking fast and it won't be long before it sinks beneath the waves. Capture all four treasures and make it to the helicopter rendezvous point at Fools' Landing, and you win, but the water level is rising with every step! Careful collaboration and strategy are necessary to successfully complete this treasure hunt, which is sure to be a hit. Fans of this game can also check out Forbidden Desert for even more survival adventure fun. Imagine yourself as Hermione, Ron, Harry, or Neville as you defend Hogwarts and save the day! 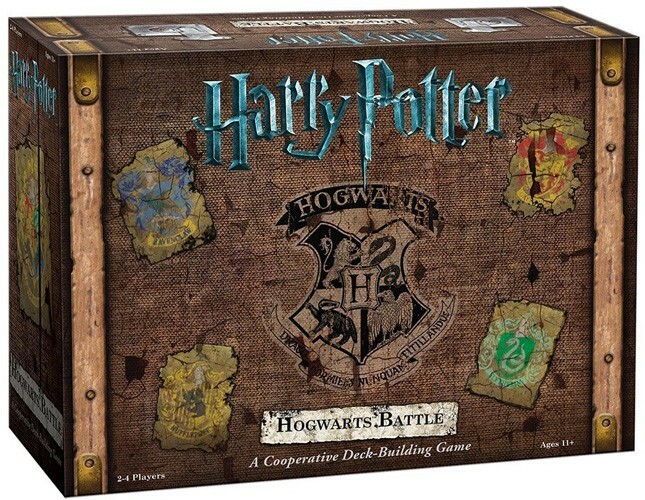 Seven different cooperative games, each building upon the last, are included in this box; each game parallels one of the seven books in the series. Players needs to find Locations and learn how to counter Dark Arts if they're going to keep the Villains from overtaking their beloved school. It's the perfect choice for any Hermione Granger fan. Slavery needs to be ended, and the Abolitionists have a difficult balance to strike: on the one hand, they want to get as many slaves to freedom in Canada as they can, but on the other hand, they need to keep fundraising and urging others to join their cause. 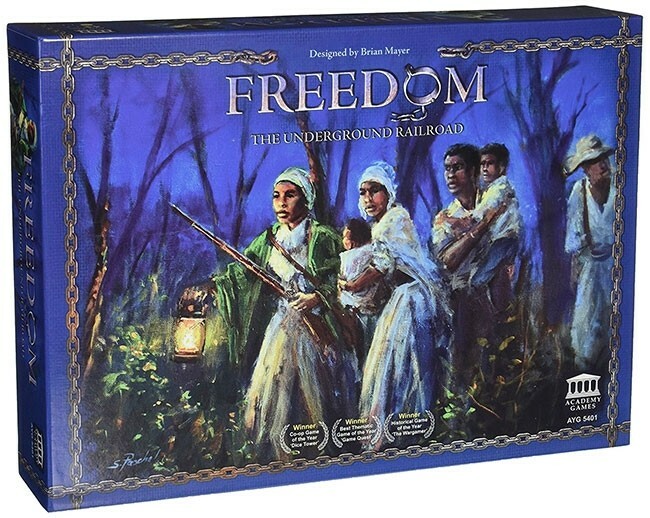 In this card-driven board game, players draw on important historical events and characters to advance their cause of the abolition of slavery. 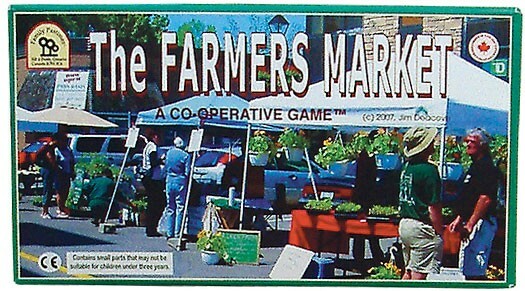 The unique setting of this cooperative game teaches players information about the historical figures, crucial events, and political agendas that pushed through the abolition of slavery. Ancient evils are stirring around the world, and only your team of colleagues can decipher the obscure mysteries and withstand the terrifying truth in hopes of saving humanity. 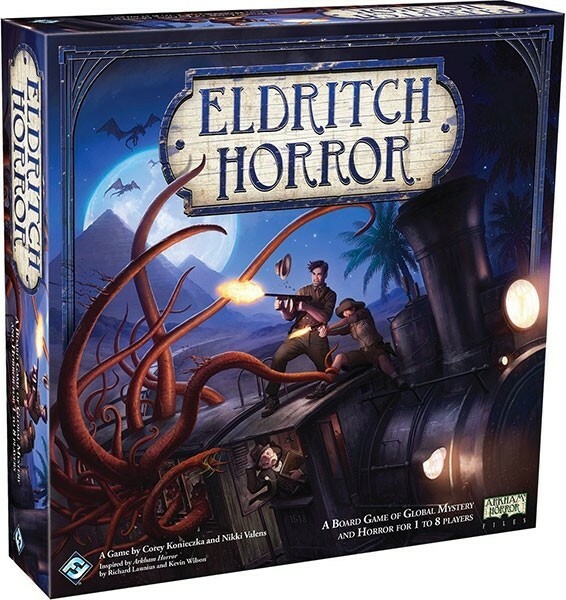 Solve Mysteries, survive Encounters, and overcome Conditions both physical and psychological as you race against time to discover Azathoth's true name or battle Cthulhu at sea. The narrative, story-driven component adds to the appeal and makes your game group feel invested in helping their characters succeed...or at least survive. Multiple expansions, including Mountains of Madness and Forsaken Lore, ensure you'll get hours of mysterious, horrifying fun from this game. To win this social word game, you'll have to work your brain! The spymaster knows the secret identities of multiple agents, and their teammates need to get in touch with the ones on their side. 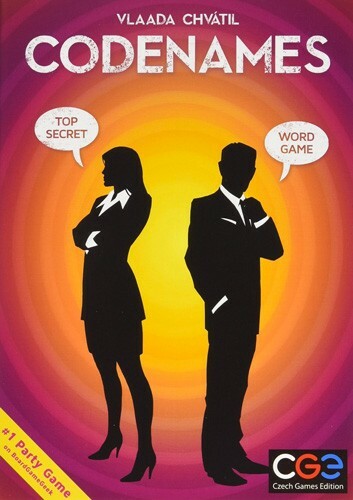 Spymasters choose one-word clues, and teammates need to pick codenames without accidentally choosing opposing spies or the assassin who ends the game. Play cooperatively for points, or choose a competitive variant where teams play against one another. Win or lose, it's fun to figure out the clues!